Virtual and cashless payments are growing at breakneck speed right now in India. According to the figures released by RBI for FY 2015, more transactions were done through use of ATM, Debit Cards, Credit cards, Internet Banking and online wallets compared to traditional paper based transactions. 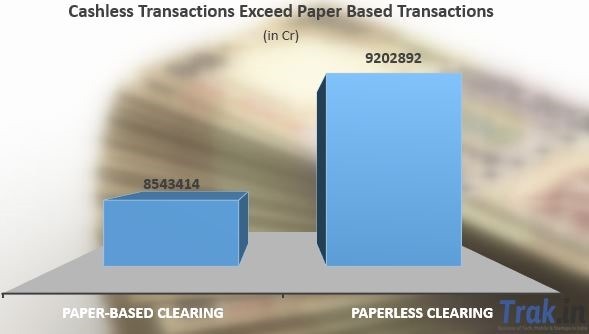 Paper based transactions in the last financial year i.e. 2014-15,cleared through cheques amounted to Rs. 85 lakh crore. While paperless transactions in the same year using credit cards, debit cards, NEFT and online wallets amounted to Rs. 92 lakh crore, reports Economic Times. The rise of ecommerce in the country has also given a boost to the virtual payments to a great extent. Banks and financial institutions offering discounts on purchase with credit/debit cards and online wallets offering attractive deals for payments have made Indians comfortable with paperless transactions. Availability of electronic items at easy EMIs has also played a major role. According to State Bank of India 69% of daily transactions through them are cashless and the bank has reported an increase of 35% in virtual transactions from the last financial year. PM Narendra Modi recently urged all citizens to use the cashless transactions as much as possible because it is the best way to take down the black money. Even at the Budget 2015 announcement, FM Arun Jaitley said that Government will be encouraging the people to make use of debit cards and credit cards rather than cash transactions as it will overcome the leakage of money from the economy. Also, Finance Ministry has revealed in their recent reports that within a timeframe of 10 years, majority of transactions in India will become cashless, while paper transactions will remain limited to a small fraction. Encouraging the modern means of payment are on priority list for the Modi government. Recently, RBI cleared a proposal where they removed need of 2 Factor authentication for transactions less than Rs. 2000. This should definitely push cashless transactions for smaller amounts. India had around 18 million credit card holders and 280 million debit card holders as of year 2014. Online and mobile wallets have seen meteoric rise in numbers over past couple of years, though their numbers are still relatively small. As per recent report by HDFC Bank, mobile wallets are expected to grow at a rate exceeding 40% over next five years and exceed 100 million users. Use of virtual and plastic money has definitely made life much more convenient. Younger generation now prefer the online mode of transactions, and it is going to only increase from here on.